Depending on the season, the beginning of this activity takes place at different times at evening. The stargazing activity on Mount Teide takes place on Fridays throughout the year. We are comparing Mount Teide Sunset & Stargazing Adventure Prices from leading ticket suppliers and Try to find you Cheap tickets prices on the market. This fabulous experience combines a few activities, such as experiencing the sunset on Mount Teide, enjoying delicious Canary dinner and marveling at the stars as the night descends. On the altitude of the Mount Teide Observatory, it is possible to examine the night sky in its entire beauty away from sources of light that diminish the appearance. This magnificent activity includes the sunset experience in addition to star watching. For the greatest experience, the typical Canarian dinner and the sparkling wine are some of the additional amenities. Telescopes are available for a detail look at stars, as well as an assistance of the expert guide. The sunset and stargazing experience is a great experience for romantic people and all those who are enthusiastic about the night sky. The activity reveals interesting facts about the universe and you will have a clear view on planets and constellations. Your Experience With Mount Teide Sunset & Stargazing Adventure? This interesting adventure allows you to examine the sky over the Canary Islands when it is beautiful the most. First, you will experience the magnificent sunset over Mount Teide National Park and Tenerife. Second, the stars will amaze you once the night descends on the Canary Islands. Third, you can see how the shadow of Tenerife Island stretches all the way to Gran Canaria Island. Finally, a complimentary traditional dinner contributes to the romantic experience. What Mount Teide Sunset & Stargazing Adventure Includes? 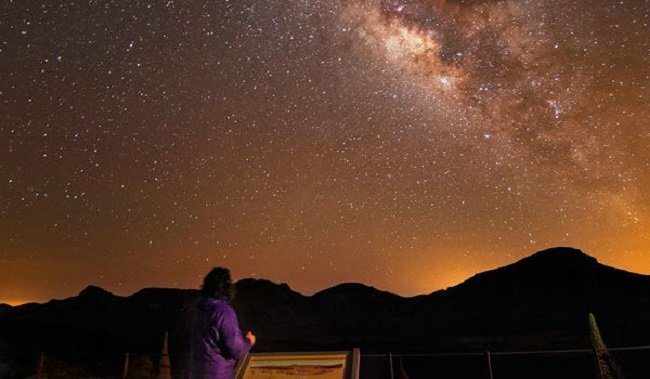 With the ticket for this entertaining activity, you gain access to the Mount Teide Observatory and assistance of a professional guide. The typical Canarian dinner and the sparkling wine are complimentary amenities of the sunset and stargazing experience. Use of the telescopes is also included. If booked, you benefit of the transfer and the VIP ride on the cable car. Dress yourself well for this amazing experience since temperatures on higher altitudes are lower than below. Also, make sure you don't suffer from heart and breathing issues because the oxygen level is lower at the stargazing location. Travelers Reviews about Mount Teide Sunset & Stargazing Adventure? The overall rating of this activity on the Get Your Guide website is 4.8, 5 on Viator and 4.5 on TripAdvisor. People that took part in this tour describe the experience as romantic, fun and informative. Most of them were very satisfied with the provided service. The stargazing experience isn't suitable for people with disability issues. Mobile and paper vouchers are acceptable for this type of activity. If weather conditions happen to be unfavorable, the tour may be cancelled. Put warm clothing and footwear on because temperatures on Mount Teide are lower than in the resorts. If you are unsure about whether your health issues could affect the participation in this activity, consult the doctor. Meeting point is the Cable car station.